This blog is meant to be a chronicle of the (mis-) adventures of my family and I as we adjust to country life. I'm a hands-on kinda guy, so many of the posts will take the form of illustrated How-Tos. After about 4 weeks, Cornish Cross chickens are ready for the move outside. Cornish Crosses are very fast growers. Most other breeds take more like 5-6 weeks to reach this stage. What you want to look for is feather growth. Remember, the reason chicks are placed in a brooder is because they can’t control their body heat and need to be kept warm. Feathers provide the insulation for them to do this on their own. 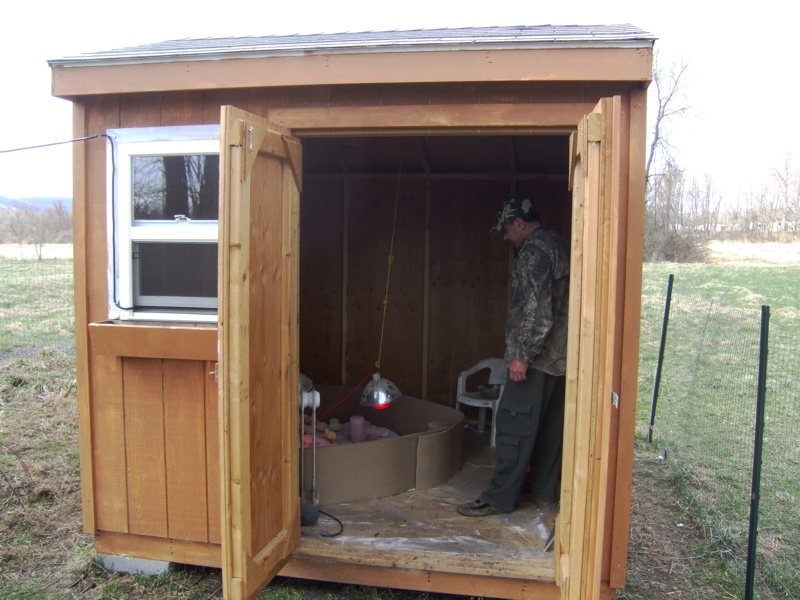 So as soon as your chickens look like the fine specimen on the right, they’re ready for the great outdoors! Newly-hatched chicks, just like human babies at the beginning of their lives, cannot maintain their own body temperature and so are susceptible to cold or over-heating. This lasts until their fuzz is replaced with feathers, at the age of 4-5 weeks or so. In the wild, chicks are cared for by the mother. However, if you’re hatching eggs in an incubator or ordering day-old chicks, you don’t really have that option — not to mention the fact that domestic hens often make terrible mothers, because of breeding that focused on egg-laying rather than mothering skills. 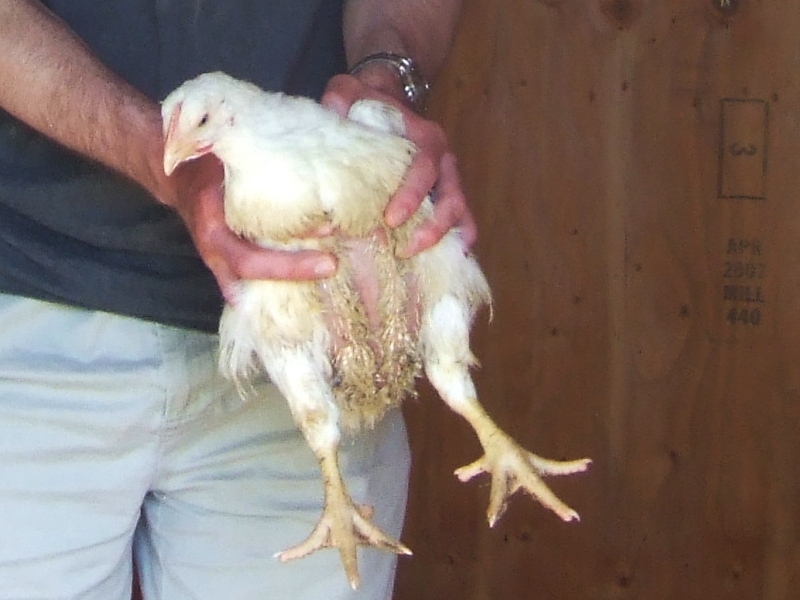 We’ve had chickens for 2 full years now, and our only problem with predation had been our own dogs and passing coyotes. Coyotes are shy of humans and only come by night when the chickens are safely locked up. I’ve only seen one on our property during the day, and it was gone as soon as it saw me. The dogs are not shy at all, and it’s hard to convince them that small running animals should not be chased, but it can be done with a little gentle persuasion. Last week, we had a dry, sunny spell that was all too brief, but it allowed us to get started on a few summer projects. Most importantly: expanding our garden. In the picture you can see our current garden as it appears currently (it’s greener later, I promise). 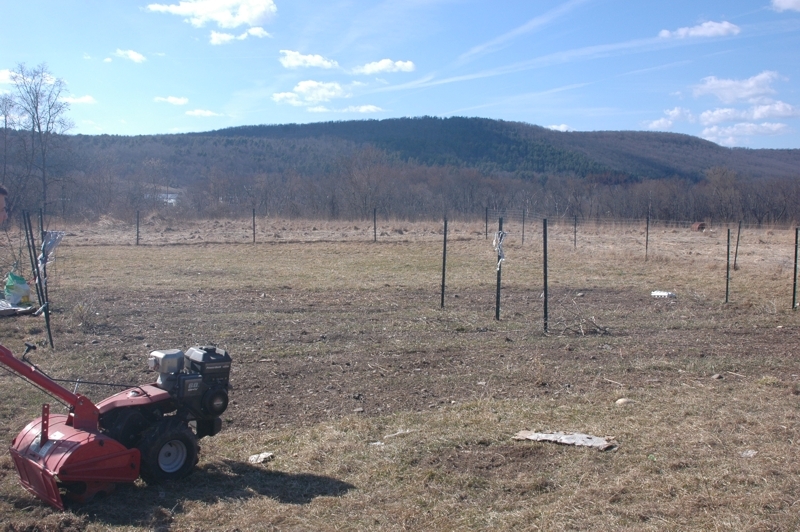 This year, we want to incorporate the area in the background, between where the soil is tilled and the fence at the back. In the foreground is our tiller. We got it before we had our Kubota tractor. A tiller for the tractor is a much smarter idea, and they actually cost about the same. But oh well, we’re working with the tools we’ve got. 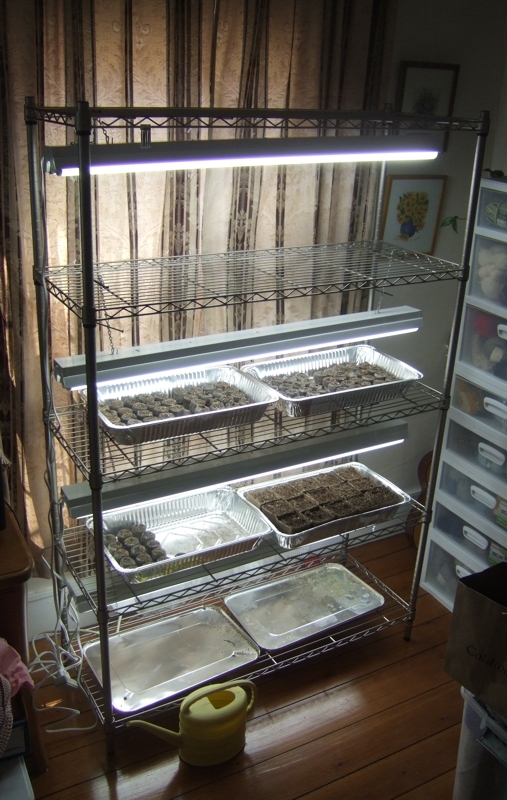 The growing season in Upstate NY is not nearly as long as one would like, so it’s helpful when you can start seedlings indoors, while it’s still too cold outside. However, commercial grow lights can be expensive, starting from $129.00 for this Tabletop model to $569 for this heavy duty 3-shelf model. In this tutorial, I explain how you can make a 4-shelf one for around $140. Assembly time is also under an hour. 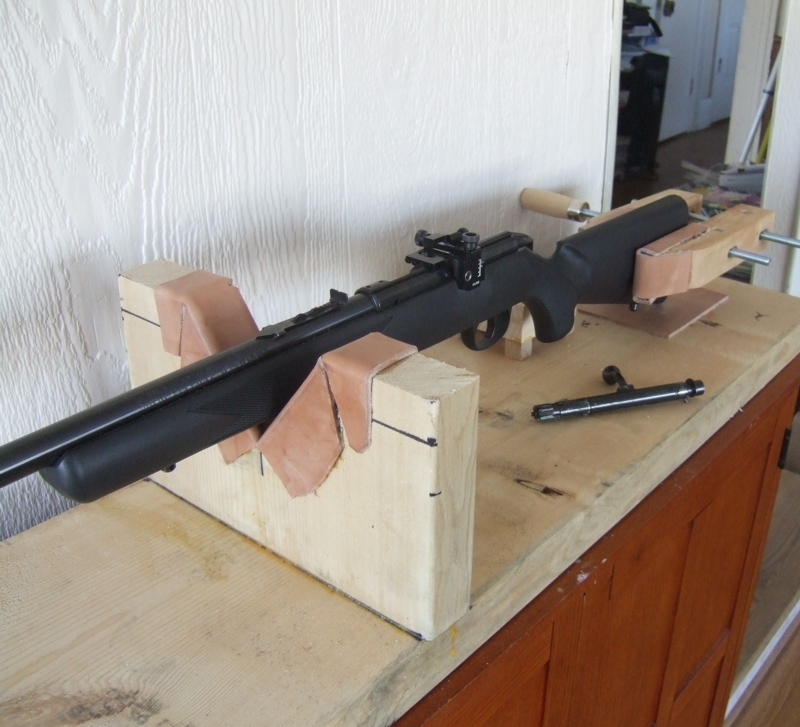 One of the hobbies that I took up after moving out to the countryside was firearms. Many people living in cities don’t like the idea of guns, and I agree to an extent. A packed, stressful environment like the city is probably not the best place for people to have guns. Out on the farm, things are different. 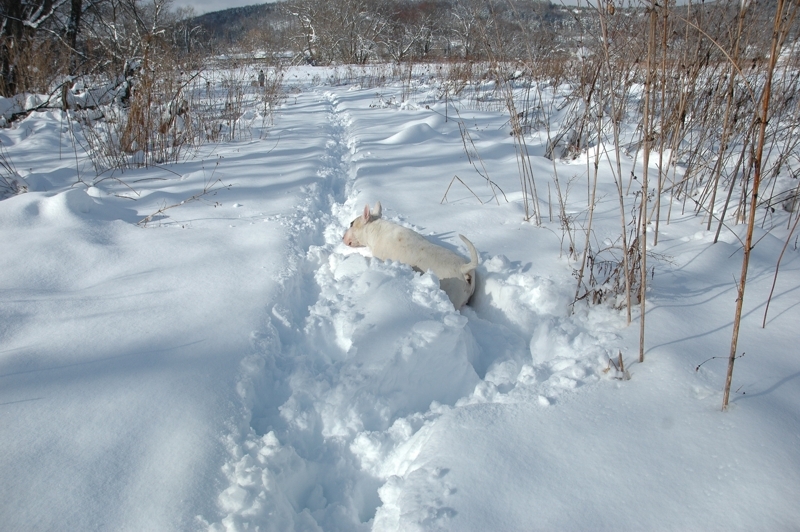 Though our fields may currently look like THIS (poor Tuna sinking in the snow up to the ears!) it’s the time to start gearing up for the growing season. Clearing the driveway next morning is my least favorite part of any snowstorm. On the farm, we have a very convenient driveway that loops all the way around the house, making it really easy for multiple cars to get in and out. Easy, that is, unless it’s packed with about 20 tons of sticky, wet snow. This was the situation we awoke with this morning. 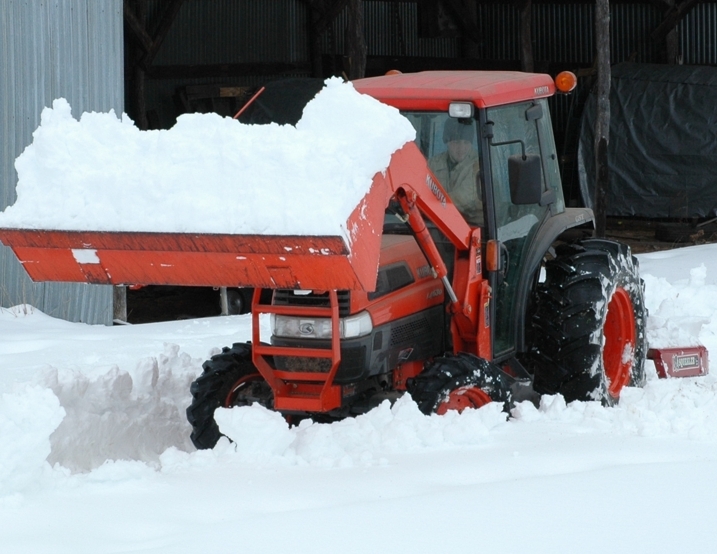 There’s no surprising most Eastcoasters with massive snowfall this year after the series of blizzards that battered the Eastern seaboard over the past couple of months, but Central NY has been relatively left out of the party. 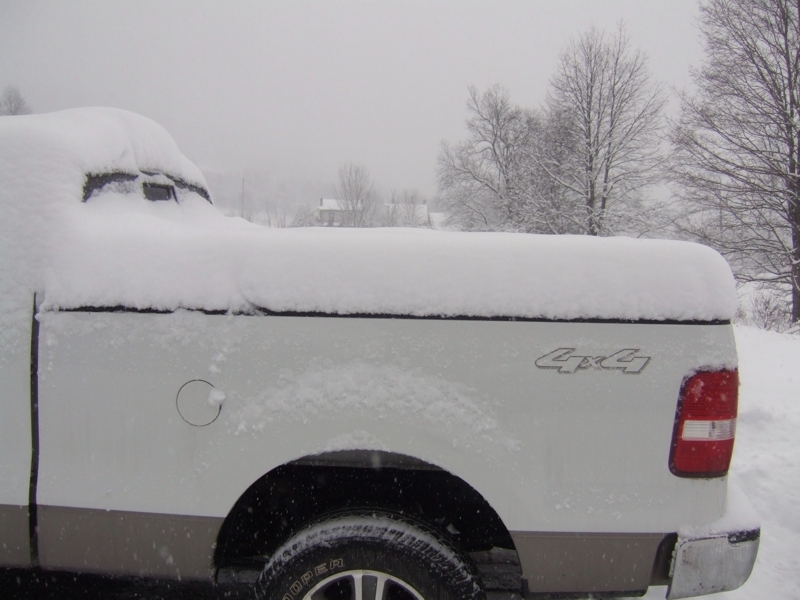 The snowstorms that dumped feet of snow over places like Virginia and North Carolina gave us scant inches. I haven’t even been out cross-country skiing this year. Until, that is, today. I absolutely love beef jerky. Not only that, but it can be very good for you. Unfortunately, my family has been eating only organic beef for over a decade now (since 1997… at some point, I will probably explain our reasons). While the “organic revolution” has been making great strides recently, organic beef jerky is not yet really widely available, especially in backwater Upstate NY where we live. Armed with an Excalibur Deluxe Food Dehydrator, I set out on the quest for beef jerky. This is the method I worked out after a few trial runs. Copyright (c) The Blogging Farmer.